PALMDALE, Calif. – Dec. 10, 2014 – Northrop Grumman Corporation (NYSE:NOC) has completed – on budget and on schedule – the center fuselage for the first F-35 Lightning II aircraft to be ordered by Norway, a conventional takeoff and landing (CTOL) variant designated AM-1. The company celebrated the production milestone with a brief ceremony Dec. 4 at its Palmdale Aircraft Integration Center of Excellence, the site of its F-35 Integrated Assembly Line (IAL). Royal Norwegian Air Force Col. Odd-Steiner Haugen, the Norwegian national deputy in the F-35 joint program office, attended the ceremony on behalf of the Norwegian government. "Today's event marks another key delivery on the F-35 team's promise to produce a fifth-generation, multirole fighter that can meet the common air combat requirements of the U.S. and its allies," said Brian Chappel, vice president and F-35 program manager, Northrop Grumman Aerospace Systems. 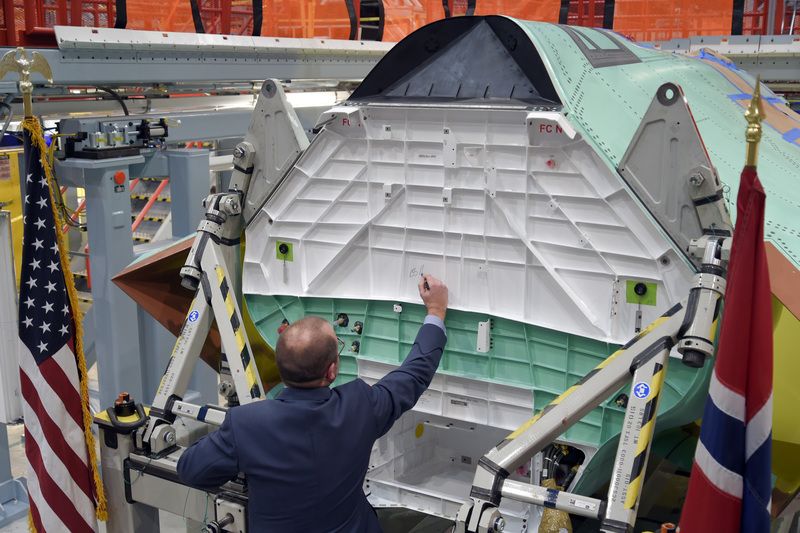 "Using our Integrated Assembly Line, we're continuing to reduce the time and cost required to produce an F-35 center fuselage. Our success is helping the industry team meet the operational need dates of our international partners." 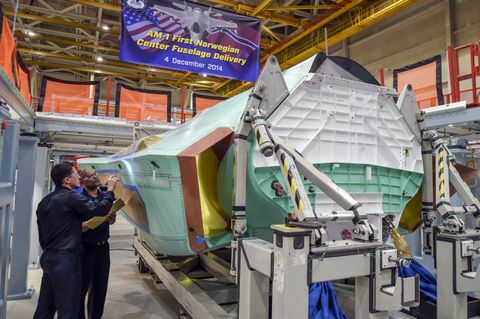 The center fuselage is the core structure around which every F-35 joint strike fighter aircraft is built. As a principal member of the Lockheed Martin-led F-35 industry team, Northrop Grumman designed and produces the center fuselage for all three F-35 variants: CTOL, short takeoff vertical landing (STOVL) and the carrier variant (CV). 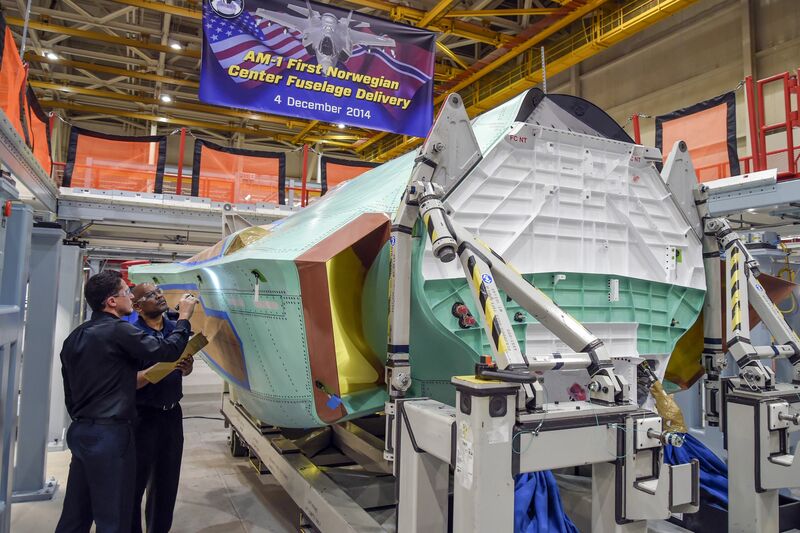 The AM-1 center fuselage is the first of 52 center fuselages that Northrop Grumman will produce for Norway. 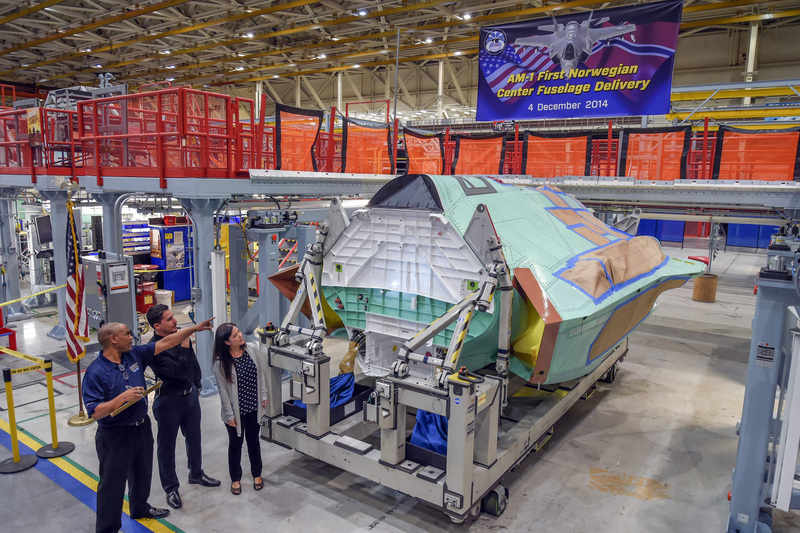 It is the 166 th center fuselage that the company has produced at its Palmdale site, and the 34 th such unit delivered to Lockheed Martin this year. Lockheed Martin Aeronautics will perform final assembly and checkout of the Norwegian F-35s in Fort Worth, Texas. The process includes mating the center fuselage to the forward fuselage/cockpit and wings produced by Lockheed Martin, and the aft fuselage and empennage produced by BAE Systems. The IAL is a highly automated set of work cells developed to assemble – efficiently, affordably and with high precision – the center fuselage for all three variants of the F-35 joint strike fighter. It occupies more than 200,000 square feet of factory floor space and includes more than 700 tools required to operate 78 positions. Northrop Grumman plays a key role in the development and production of the F-35 weapons system. In addition to producing the jet's center fuselage, the company produces key F-35 radar, electro-optical, avionics and communications subsystems. It also develops mission systems and mission-planning software; develops and maintains pilot and maintainer training systems courseware; and manages the team's use, support and maintenance of low-observable technologies.